Think Penang is hawker heaven? Okay, while the island offers some of the best in the country, the fare in Kuala Lumpur ain’t half bad either. THERE’S more to fishball than just fish. The sight of these glossy, ball-shaped patties has the power to lull even the most ravenous of lunchtime crowds into gentle submission. That’s what I recently learned on a jaunt to Madras Lane in Kuala Lumpur, led by Swiss Inn Kuala Lumpur’s vice president of operations Jimmy Chow, 55. The long, orderly queue in front of the Madras Lane Yong Tau Foo stall is a dead giveaway. Behind a counter, owner and king of fishballs Ngeow Han Kong, is hard at work steadily fulfilling orders from some of his most loyal customers by tossing fishballs and a variety of other fish paste-stuffed vegetables into a large vat of boiling broth. Ngeow’s success isn’t much of a secret: apart from his remarkable tofu-stuffing skills (word is that he’s able to stuff up to 200 tofus in an hour! ), he makes the fish paste fresh daily, using only saito – or wolf herring fish – because the fish forms a natural starch when sliced by hand and whipped. It gives a smooth, bouncy texture to the fish paste, making it an ideal stuffing for yong tau foo. Chow was just one of Ngeow’s legions of fans. “I used to take a bus here with my father when I was a child. I’ve been coming back ever since,” he said, as we watched beads of perspiration trickle down Ngeow’s forehead from the combination of hard work and the sweltering mid-day heat. Working at the Swiss Inn, then, seemed like a natural decision for Chow, whose attachments to his favourite childhood haunt still runs deep. The hotel – which bagged HotelClub’s Top Hotel for Hawker Food Award last year – is located right next to Chinatown, home to some of the most fascinating spots left in our city. Among these is Madras Lane, a gritty and not-so-pretty hawker centre behind the dim, decrepit Pak Peng Building where eight food and drinks stalls jostle for space. Chin Kim Fook’s wifeknows thatit’s all about thecurry, curry, curry (below). But what it lacks in style, it makes up for in character. 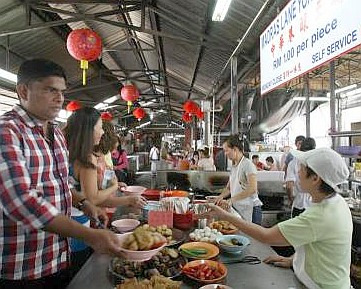 In an era fuelled by conscience and food trends that endorse eating organically and sustainably, hawker centres like the one in Madras Lane have gained a subversive reputation, providing a stirring mix of nostalgia and rebellion on par with the Happy Meal or a box of Tora. Locals wolf down bowls of piping hot food by open drains, turning a blind eye on First-World terms such as nutrition and sanitation, while chickens cluck in cages at the market next door. Then there are others like Chow, who makes frequent pilgrimages here, because of the ambience. Authenticity, he claimed, is often the missing ingredient in many of his gastronomic experiences, and Madras Lane provides just that. “Where else can you eat on a five-foot walkway? Certainly not Singapore!” quipped Chow, who believes that the surroundings give the food a special “oomph”. But this miniature boomtown isn’t what it was 30 years ago. If Petaling Street is a celebrated tourist attraction, Madras Lane is its long forgotten cousin. Though the official name of the spot is Jalan Sultan, the hawkers still cling stubbornly to its old name – an homage to the Madras Cinema that burnt down in 1979. Much has changed since the 70s. A thick coat of cement has replaced the dirt floor. A shade was erected where there was none. In her article The Shrinking Of Madras Lane for a local website, Debra Chong noted that Madras Lane was once an open space. Business was brisk until that fateful day. The flames razed the building to the ground despite the firemen’s best efforts to put it out and, over the years, this historical alley has shrunk to half its size. These days, an occasional tourist would stumble in by accident, but the stench and swelter would soon drive them away, seeking creature comforts within the air-conditioned confines of the Swiss Inn’s Café Petaling. However, those who are plucky enough to linger would be greatly rewarded by the springy fishballs from the Yong Tau Foo stall, the fragrant rice-noodle rolls from the Chee Cheong Fun stall, and the rich spice-laden broth from the Curry Laksa stall. These stalls have been around since time immemorial. Most of the hawkers here today grew up in the neighbourhood, until skyrocketing rents in Chinatown forced them to vacate. 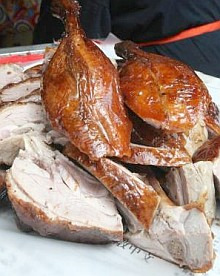 Sze Ngan Chye’s daughterhasn’t justinherited her father’s knackfor making good roastduck (below), but his smile too. “The early generation sold food as a means of getting by. Much of what you see today are recipes passed down by their forefathers. This is as original as it gets,” explained Chow, adding that many of these hawkers had to rely on the freshest local ingredients because MSG wasn’t available at the time. 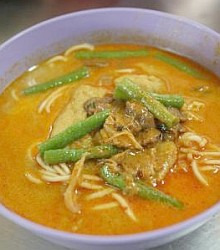 Take Chin Kim Fook, a third-generation Curry Laksa hawker at Madras Lane. His family has been here for over 30 years, after inheriting the stall from their mother. 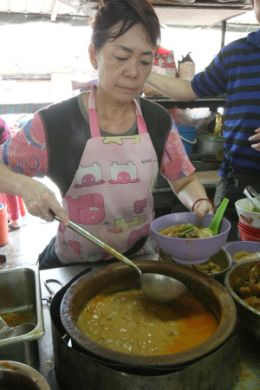 “This is her recipe,” said Chin, dishing out piping hot bowls of curry noodles from clay pots filled with mountains of cockles, pork skin, brinjals and tau pok. Meanwhile, Wan Siew Yee’s family has been operating the same Chee Cheong Fun stall for over 40 years and, on good days, sells up to 1,000 plates of these slippery rice rolls topped with a generous dollop of her mother’s secret sauce. She’s in the midst of building a Chee Cheong Fun empire, and has already opened three other outlets in Bangsar, OUG and Old Klang Road under the brand name “Madras Lane Rice Noodles”. Two o’clock came and went. 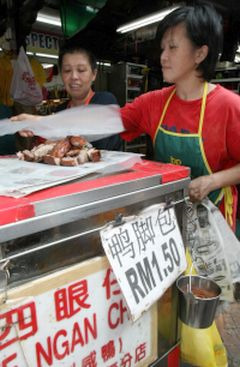 The office workers disappeared as quickly as they had appeared and many of the hawkers started washing up for the day. I held my breath as Chow led me out of Madras Lane, passing freshly-butchered animals and newly picked vegetables displayed at the wet market along the way. We finally made it out into the open, and a short stroll took us to Sze Ngan Chye’s Salted Roast Duck stall. Apparently, Sze Ngan Chye – which literally translates into Four-Eyed Boy – is the nickname of Chong Peng Phoon. A Petaling Street vendor for more than 60 years, Chong started selling the ducks in the 1950s. While most hawkers swap traditional cooking methods for faster and more modern techniques, Chong has remained steadfast in his ways. He prefers to roast his ducks over a traditional charcoal stove, giving them a special flavour that only someone with the same amount of patience and wilfulness can replicate. Many of Chong’s first-time customers are delighted to learn that his ngap keok pau (duck feet parcels) aren’t as scary as it sounds. While this combination of various duck parts like the feet, liver, kidney and intestine would certainly make it into an episode of Andrew Zimmern’s Bizarre Foods, it certainly possesses the taste and sophistication of, say, a Michelin-starred meal. Unfortunately, being semi-retired, Chong was not around to bask in the day’s limelight. A good-humoured lady who introduced herself as his daughter has taken over his usual spot behind the mobile stand, cheerfully aware of what an honour it was to replace the King of Roast Ducks. Once she retires, however, it’s a whole other story. It seems no one in their family is willing to take over the business because of the hard work involved. I bit into a tender, juicy slice of duck, grateful to be one of the people to be able to savour a part of our vanishing history.